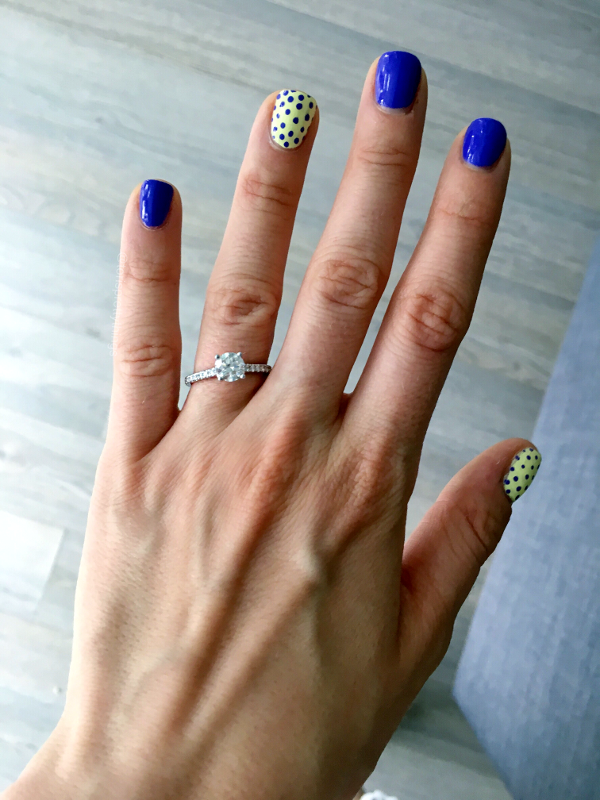 Of course, it wouldn't be a Mani Monday if we didn't talk more about the mani I got engaged in! That accent nail? A true coincidence. Yet somehow, I just had this gut feeling - I just knew - this would end up being the mani I wore when B and I got engaged. 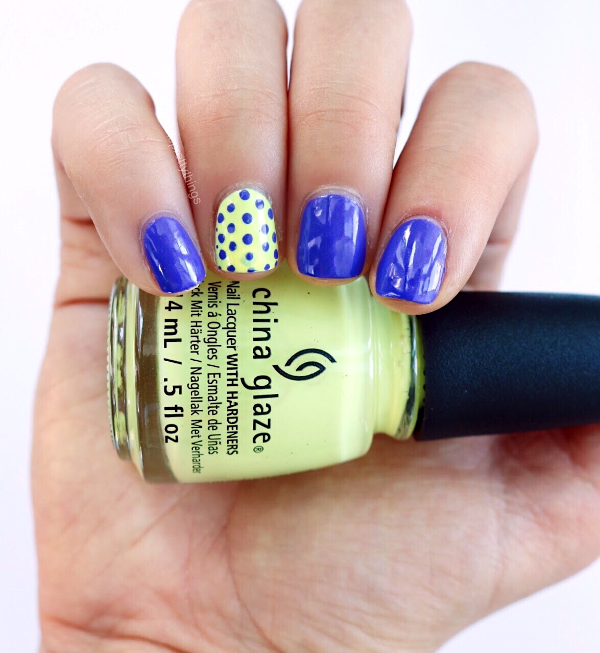 This simple two-color dotticure idea popped into my head somewhere near the middle of June. In my summer stash, I started with about 12 untried shades to tackle this season. When I placed these two colors in my jar of untrieds, they felt like a perfect summery pair. But then I wore these and then thought of these. Then I wanted something patriotic so I wore these. Finally, I said enough is enough and I painted this pretty little design. Once I did, I just had such a feeling! I even debated about putting yellow dots on the middle finger but decided against it. Maybe it was my subconscious or maybe it was something else, but somehow I just knew! Not only can I not ask for a more perfect ring, I couldn't ask for two better formulas! I Got a Blue Attitude is such a fun shade - in these photos (and when I painted them) they looked perfectly purple. In darker light, though, they pulled almost navy. What you see here are two easy coats. For Whip it Good, I'm a little bit of a yellow polish hoarder. Good yellow polishes are so hard to come by. So when I see a beautiful pale neon yellow like this, it must be mine! Both shades were beautiful before, but now that they're part of such a special memory? I can't see myself parting with either shade anytime soon :).